You may recall that I spoke of a unique set of challenges experienced by schools, which I and many others believed helped to explain why Peterborough is faced with the highly unusual scenario of being one of the best areas of the country for the number of schools judged ‘good’ or ‘outstanding’ by Ofsted, yet attainment being one of the weakest. 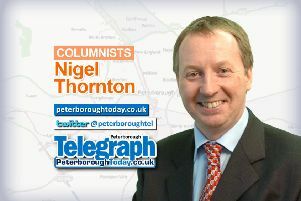 The task that I set Councillor Lynne Ayres, cabinet member for education for the city council, was to lead a review to see whether there was anything more that we, the schools, and anyone else involved in education could be doing and to test whether the challenges that many people believe exist in Peterborough are fair and accurate. Yesterday (Wednesday) Cllr Ayres published her review and made a number of recommendations which I believe will support everyone involved in education in Peterborough to work together more effectively to address the issues that we face and to ensure a bold educational strategy. In her report, Cllr Ayres concludes that Peterborough does have what can only be described as a unique set of challenges, meaning schools face more of an uphill climb than their counterparts in other areas of the country to achieve expected standards for pupils. I am pleased this view has been supported by not just Cllr Ayres, but the Nullam Group, which she tasked as part of her review to consider the challenges we believe the city faces and to confirm if these had been identified correctly. However, this does not distract from the need to make changes, and in her report Cllr Ayres makes a number of recommendations which I fully support. This includes better joint working between the council, schools, Teaching Schools, Regional Schools Commissioners, Ofsted and others to tackle the challenges identified, which Cllr Ayres believes can be addressed by establishing a Strategic Board for Education, Further Education and Skills. The benefits of working together more closely cannot be denied, and with the council’s role in education far reduced, and reducing all the time, never has it been more crucial. The recommendations also include a focus on improving the recruitment and retention of teachers, and on narrowing the gap between free school meals and special educational needs students and those in all schools. Cllr Ayres found a real ambition from everyone involved in education in the city to provide the very best education possible for every student - this is something I have myself witnessed. It’s for this reason that I look forward to working with schools and all our partners to carry forward Cllr Ayres’ recommendations as I believe that together we can provide an education system that works for all children in Peterborough. I’d like to say a big well done to everyone who collected their GCSE results last week. The new grading system put added pressure on pupils it’s fair to say, but it’s encouraging that despite this, similar proportions of students achieved a pass to those last year in the key subjects of maths and English, with a slight increase in the numbers doing well in maths. The day was particularly special for me as my granddaughter Charlotte, a pupil at Jack Hunt, achieved six A*s and two As. This followed on from her sister Abigail, who attends Arthur Mellows Village College, who the week before achieved excellent A-level results. A short mention to finish about the BBC Concert Orchestra’s performance of a Film Music Gala at the Broadway Theatre on Saturday night. You might know that it marks 80 years to the day since the building opened as the city’s first purpose built cinema, the Odeon. I am sure many of you, like me, will have many fond memories of time spent at the Odeon in your younger days.